A high-end counter that mounts on both bikes and motorized wheels. 32,47 € 32.47 tax incl. Here is the counter TRELOCK MC 700, this German brand counter is really upscale and suitable for scooters, bike, motorcycle, ... It has many cool features and is very robust (shockproof shell, water resistant ...). The editing is very simple! There are 2 magnets provided, one for spoked wheels, one for aluminum wheels to be glued. The meter is normally installed on the handlebars but nothing prevents you with a personal installation to put it elsewhere. 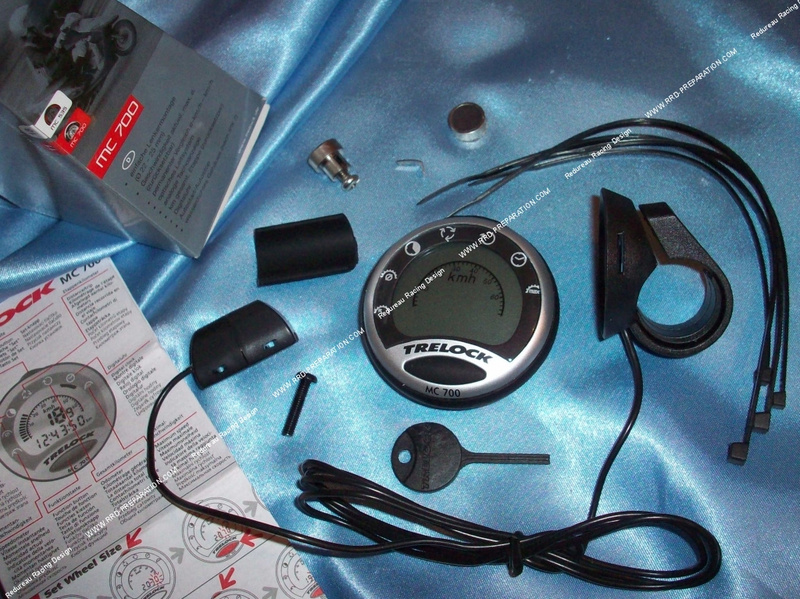 View on a personal montage of a TRELOCK meter. For this we created an interlocking system, a carbon plate, a neman of industry ... This plate was intended for a MBK 51.